Keto is not just a diet, it’s a healthy style of living. I have joined so many keto groups and I have seen miracles. Not only people lose their weight but they improve their health problems too, like high blood sugar and blood pressure. Keto is all about eating healthy, organic and pure food. With a keto diet, your body converts fat, instead of sugar into energy. 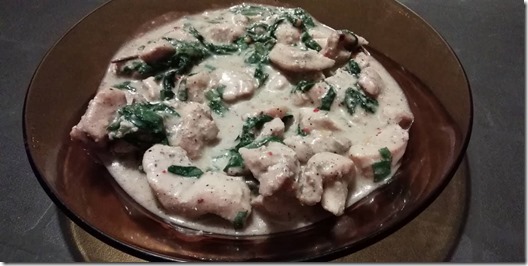 I am sharing this keto chicken in the white sauce recipe. I cooked this with some spinach. You can add mushrooms or broccoli too. Heat butter in a pan and sauté garlic paste. Now add coconut flour and cook for one minute. Add coconut milk and keep stirring it. Add salt, black pepper, red chili flakes and spinach in it. Cook for another minute or two. 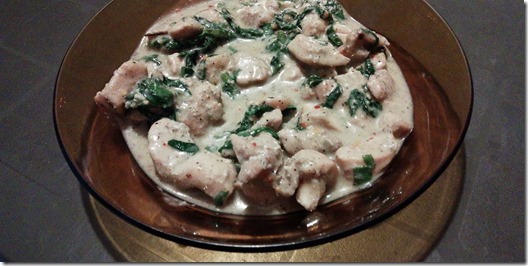 Add cooked chicken and cream in it. You can also add cheese on top. I served this with almond bread. Hi, this seems so interesting because the food looks delicious and turns out to be healthy. I was wondering if you’d be able to do a post on a meal prep for keto or what/how to eat in a day on keto ? thanks niha…. will definitely post on keto meal plan to make things clear for all of you.